My cousin just sent this picture to me today. It was taken in the custodian's closet at the elementary school we attended (which closed years ago & is now a community center). Random? Not really. The custodian of the school was my Aunt Bonnie. I often would go into school with her in the early mornings before anyone else would arrive. There was something magical about school that I truly fell in love with. I think this had a huge impact on me & my desire to spend a lifetime in education. Back then, I would often help her do some of the custodial tasks around the school. Sweeping rooms, picking up crayons & pencils under desks, mopping the gym/cafeteria floor....hard work for a kid, but I loved it. As I got older, those of us on free/reduced lunches were required to work in the cafeteria. We spent a lot of time with the cafeteria ladies, and they treated us like their own kids. I was able to see how so many people were involved to make "school" happen. Each one was important. Each one deserved respect for their contributions. I loved the community that made school possible. I knew by the 1st grade that I wanted to be a teacher. Back to the sticker... My cousin (who is a kindergarten teacher now) & I were in the same class K-8th grade (that is how our elementary schools were set up)....and had classes together throughout high school. She often helps out at the community center (our former elementary school), and was cleaning up after an event. She walked in and found this sticker in the custodian's closet. She knew right away that it had to have been me. My love of turtles goes back...way back! ha ha Amazing how after over 30 (EEK!! 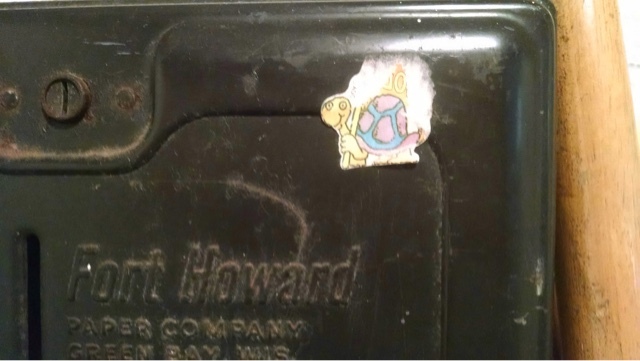 !..close to 40) years....this sweet little turtle sticker can remind me of all the wonderful things that laid the foundation for my path in education. THAT ONLY MAKES PROGRESS WHEN IT STICKS ITS NECK OUT! love this! thank you for sharing (I love turtles too--that is sea turtles).